A selection of blog-type articles, by Jay Smith, of information, commentary, and rants from our emailed E-News Philatelic Newsletter. What are fluorescent and phosphorescent stamps? How do they relate to Scandinavian philately? Which type of UV light do I use to see them? What are the safety issues? "The language of stamps" or the meaning of stamp positions on letters and post cards. Why some seemingly correctly franked post cards have postage due charges. Illustrated and clearly described. If you have puzzled about these, take a look. 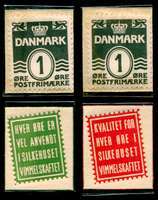 An illustrated discussion and explanation of the forgeries of the Danish "postal ferry" stamps, including an overview of the genuine overprints, stamps, cancellations, and usages. Also illustrates examples of genuine stamps with inappropriate cancellations. This page has a large number of illustrations and may be time consuming over a slow modem connection. Please be patient. An excellent example of what can be done with an FDC exhibit as well as a comprehensive study of the cachets, postmarks, and uses of FDCs of this issue. Detailed information about the issues and illustrations of collateral material. The variations of the one type Greenlandic tax stamp, along with reproductions of original documents. Describes and pictures the forgeries and genuine stamps. Identifying and discussing the two types with illustration. Expands on and adds specifics for the plate variety listings in the AFA Iceland Specialized Catalog 1997. Two major "new" plate varieties identified. Pictures all the pages of the book, including laws and regulations. 1907-1921 stamps canceled with needle holes; precursors to the Tollur cancellations. 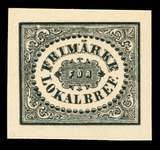 Demystify one of the most often misidentified classic Norwegian stamps. Illustrates the eight watermark positions. Coils, Booklet stamps, perforations on this side and that. Which is which and where did they come from? Who collects what and why? See examples of this unusual forgeries, as well as the genuine labels. Suggestions Wanted: Please let me have your ideas for other article topics. Published authors are most welcome to submit their already-published articles for inclusion (we will handle getting all the proper permissions). A Scandinavian links page is just beginning. A discussion forum is planned for the future.